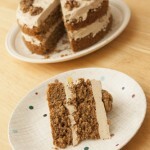 How to make a yummy Iced Date & Walnut Cake. Easy to make. 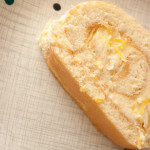 How to make a light swiss roll sponge filled with home-made lemon curd and lemon cream. 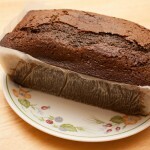 How to make a large Dark Jamaican Ginger bread sponge cake, delicious by itself, spread with butter, or as a pudding. 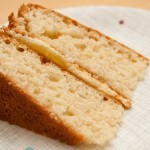 How to make a delicious light lemon sponge gateau with home-made lemon curd filling and covered in lemon cream. 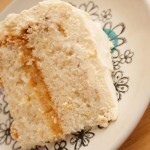 How to make a Coffee and Walnut Sponge Cake with a Coffee Mousseline cream filling and topping. How to make a Gold Sandwich cake with a jam or marmalade and buttercream filling. 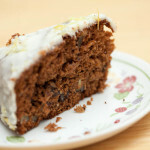 A great cake to make if you have left-over egg yolks. 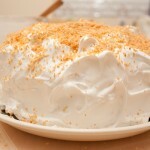 How to make a lovely lemony sponge cake with lemon frosting and a coconut topping.